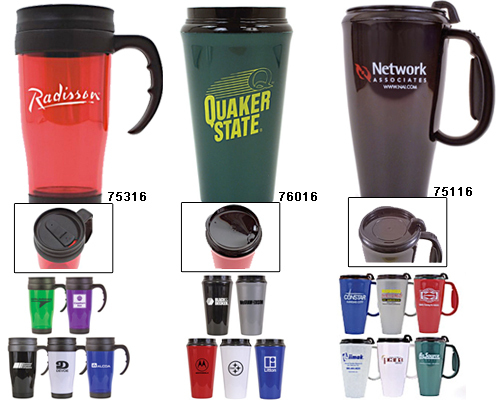 These Plastic Travel Mugs and Tumblers are durable and versatile - perfect for sending your promotion on the road! 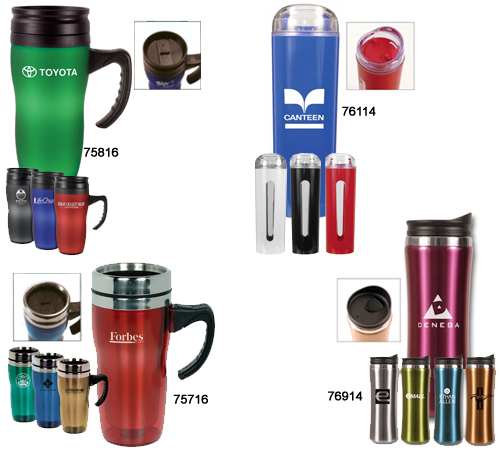 Your logo will be seen every time this stylish travel mug is used by your clients and associates. These mugs are available in 16 ounce size in your choice of four colors. Or, you may give your logo added dimension and your travel mug or tumbler a classic look with our Metallic Foil Insert, available in 7 colors, or with our Thermal Print Paper Insert, printed in 1 to 4 colors. Our Travel Mugs and Tumblers are made in the USA of durable styrene to ensure long use. Your satisfaction is guaranteed when you order custom glassware from us. 75316 16oz Evolution Mug N/A 3.42 3.33 3.24 3.15 3.06 2-1/4" 1-3/4"
76016 16oz Infinity Tumbler N/A 2.65 2.61 2.56 2.52 2.47 2-3/4" 4"
75116 16oz Journey Mug N/A 3.33 3.10 2.92 2.83 2.79 2-5/8" 2-3/4"
No Charge on Exact Repeat Orders. 75816 16oz Soft Touch Mug N/A 7.24 6.97 6.70 6.47 N/A 2-5/16" 1-1/2"
75716 16oz Utopia Mug N/A 8.50 8.05 7.87 7.60 N/A 2" 1-1/2"
76914 14oz Laguna Stainless Steel Tumbler 10.35 10.03 9.67 9.40 N/A N/A 2-1/4" 2"
76114 14oz Vision Acrylic Tumbler 7.02 6.75 6.61 6.48 N/A N/A 2-1/4" 3-1/2"